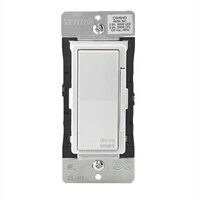 Easily replace your existing single pole or multi-way dimmer with the Leviton 600W Universal LED/Incandescent Decora Smart Wi-Fi Dimmer to allow control from anywhere. Use the free Leviton iOS or Android app to add/name devices and to control them individually or as a room with a single button push. Create schedules, scenes, and customize your experience with adjustable fade rates, maximum/minimum illumination levels, and more if desired. Leverages the Leviton Decora form factor with matching color change kits, multi-way devices, wallplates and more.